SlideClear adaptable living spaces, the modern solution for better outdoor living! Expanding your outdoor living spaces with SlideClear doors offers many advantages! Transitional rooms have become increasingly popular as many of us want more space to entertain and bring the beauty of the outdoors in. 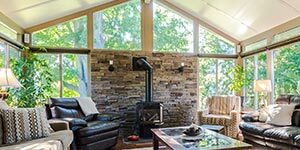 As a Butler Home Improvement Company, Sunspace Sunrooms now offers new screen solutions for larger openings: SlideClear Adaptable Living Spaces! The latest way to get the screen room you’ve always wanted! 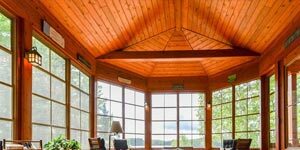 Sunspace of Greater St. Louis guarantees your complete satisfaction, whether we are enclosing a patio or installing the Sunspace Sunroom of your dreams. 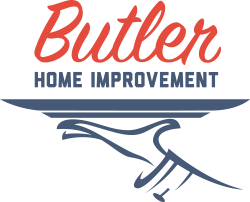 As a Butler Home Improvement Company, our hassle-free quotes, financing options and outstanding labor warranty is part of our “White Glove” Service Guarantee. We pride ourselves in offering the best service in the St. Louis community and beyond, treating our customers right each and every time. SlideClear Adaptable Living Spaces can accommodate openings up to 32 feet wide and 10 feet tall with no bottom profile. The revolutionary tracking system is extremely durable, and screens easily click into place and open smoothly. Three times more durable than traditional screens, SlideClear will last for many years to come! Available in several different colors to choose from, SlideClear doors blends beautifully with your home décor and offers views from your screen room that have never been possible before. Would you like to learn more about this revolutionary idea? Watch the video and find out for yourself how SlideClear Adaptable Living Spaces are the perfect solution for your home or commercial establishment. Butler Home Improvement serves St Louis, St Charles, O’Fallon, Collinsville, Edwardsville, Belleville, and the surrounding areas with high-quality SlideClear adaptable living spaces, contact us today to get started! Your professionalism and the way you try to please your customers in every area is outstanding. Your workers are exceptional in the performance of the jobs they are assigned to do. Thank you.